An inspiring personal story of redemption, second chances, and the transformative power within us all, from the founder and CEO of the nonprofit charity: water. At 28 years old, Scott Harrison had it all. A top nightclub promoter in New York City, his life was an endless cycle of drugs, booze, models—repeat. But 10 years in, desperately unhappy and morally bankrupt, he asked himself, "What would the exact opposite of my life look like?" Walking away from everything, Harrison spent the next 16 months on a hospital ship in West Africa and discovered his true calling. In 2006, with no money and less than no experience, Harrison founded charity: water. 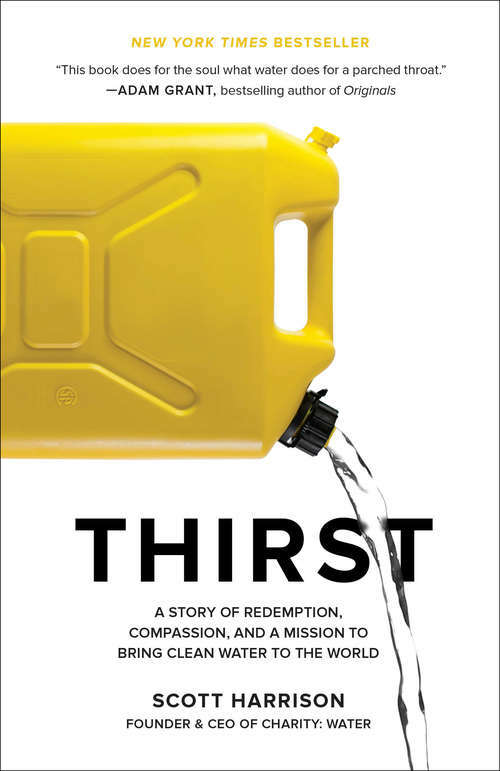 Today, his organization has raised over $300 million to bring clean drinking water to more than 8.2 million people around the globe.In Thirst, Harrison recounts the twists and turns that built charity: water into one of the most trusted and admired nonprofits in the world. Renowned for its 100% donation model, bold storytelling, imaginative branding, and radical commitment to transparency, charity: water has disrupted how social entrepreneurs work while inspiring millions of people to join its mission of bringing clean water to everyone on the planet within our lifetime.